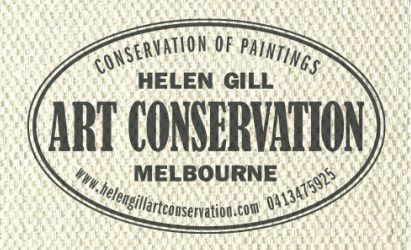 About me - Helen Gill Art Conservation - Conservation of paintings, Melbourne. I have been building a strong reputation as a Conservator of Paintings for 8 years both within Australia and internationally. Since completing a Master of Arts (Cultural Materials Conservation) at the University of Melbourne, I have gained broad professional experience working in large cultural institutions within Australia including the National Gallery of Victoria (NGV), where I was an H.D.T Williamson Fellow for two years, Queensland Art Gallery/Gallery of Modern Art (QAG/GOMA) in Brisbane, and the Centre for Cultural Materials Conservation (CCMC) at the University of Melbourne. In 2008-2009 I undertook an internship at the National Gallery of Denmark (SMK) and have since regularly returned to Denmark to undertake conservation projects. collections, regional galleries, auction houses and private clients.